If you haven’t seen Charlottesville on the news lately, you should know that the Lee Statue and the Jackson Statue still stand, covered with enormous black garbage bags so that nobody can see them, but everybody can know there’s something ugly there. The state of Virginia forbids localities from removing any war memorials whatsoever, at least if you apply laws retroactively and have no courage. Nobody has made any move to repeal that state restriction, principally because nobody wants to make any sort of move against war memorials, and only half the public supports any sort of move against Confederate war memorials, which can be found all over Virginia, dominate Richmond, and show up in the U.S. Capitol in the form of Virginia’s Lee statue there in Statuary Hall, which nobody seems to care a fig about one way or another. If action follows reporting, I will have to say I am pleasantly surprised by government bodies finally doing the obvious and sane thing despite months of public and media reaction that has seemed to focus on everything but. The big focus, of course, has been on the racist war monuments — well, some of them. As I noted in a Charlottesville TED Talk, using the above image as a slide, “If we removed only the racist war monuments in Charlottesville, we’d lose Lee, Jackson, the generic Confederate, the people who helped slaughter Native Americans, the memorial to the war that killed some 3.8 million Vietnamese (though Vietnamese was not always the term used to refer to them), and UVA’s World War I monument — a war explicitly marketed as a war against the evil race of Huns. In other words, we’d rid ourselves of every war monument.” Pictured above are: Lee and Jackson in trash bags, a Confederate Soldier, a Vietnam Memorial, and UVA’s monuments to World War I and to George Rogers Clark. While UVA, like the rest of Charlottesville, mostly treats armed fascist rallies as a question of free speech or hate speech, UVA has gone ahead of the City or the State in “strengthening” open-flame restrictions and allowing itself to prohibit guns (as if it previously were not allowed to do that). 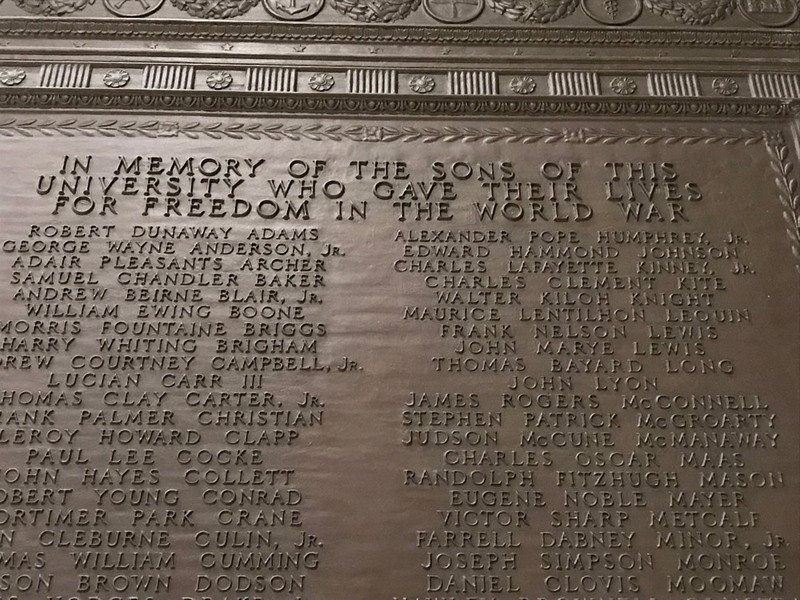 It has also moved against, not any of its racist war monuments, but one of its many war plaques. 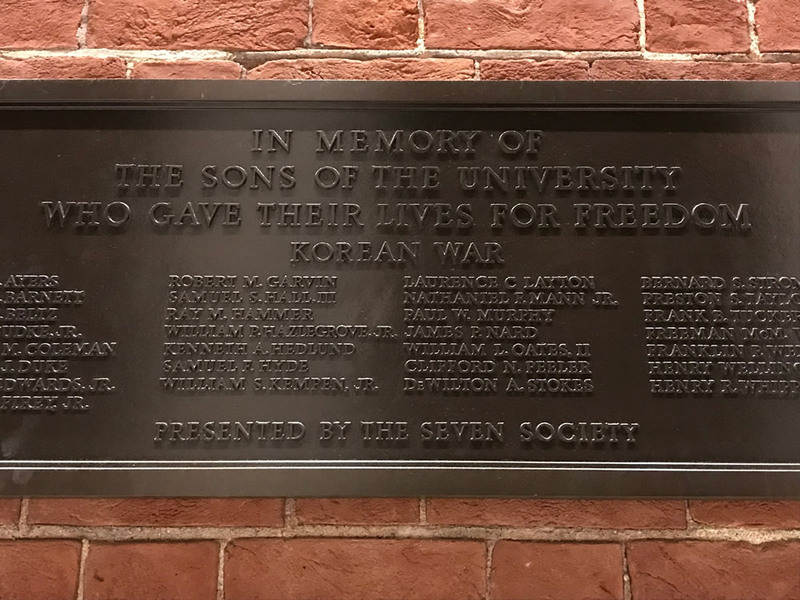 UVA has removed from the outside wall of its Rotunda building two plaques listing students and alumni who died for the Confederacy. But UVA’s Board of Visitors has asked UVA to figure out a way to commemorate people who fought on both sides of the Civil War, even though no student or alumnus died on the Union side. If UVA lists everyone who participated on both sides of the U.S. Civil War, it may have quite a lot of names. 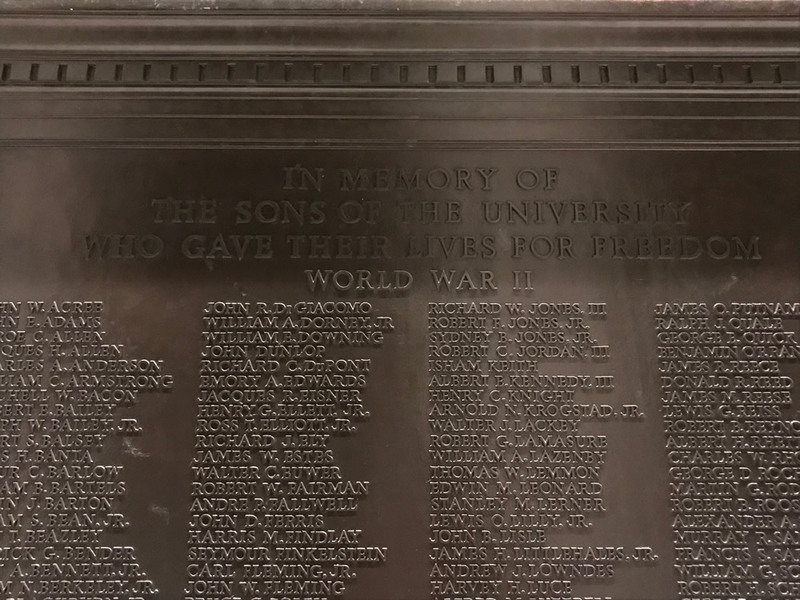 It may also lose any connection to the idea that its war plaques mourn the dead rather than simply glorifying war. 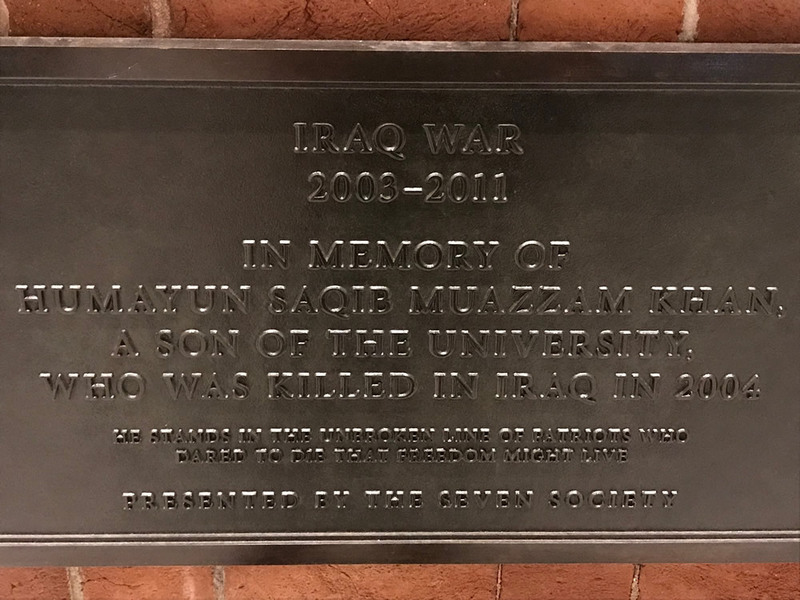 And it may have a hard time persuading even first-year students that participants on both sides simultaneously died for “freedom,” as its other plaques claim about all sorts of freedom-destroying wars. Of course we all know that this sort of propaganda is not simply about mourning the dead. There’s no mourning of dead alumni and students who died in anything other than war. There’s no mourning even of just those who died from senseless violence (murder by a lacrosse-playing boyfriend, for example). There’s mourning only for those who died in war’s senseless violence, and only if they died on the proper side of the war. Did no one from UVA die on the other side in any of the wars advertised on the Rotunda? Has the Board of Visitors asked for that question to be researched? 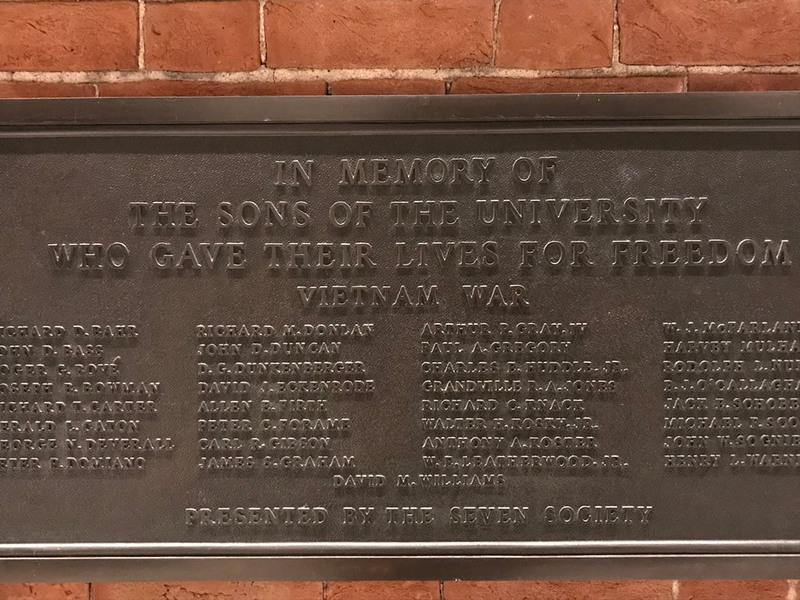 Nor is UVA’s collection of war plaques just one of the many things it memorializes. Nope, this is it. 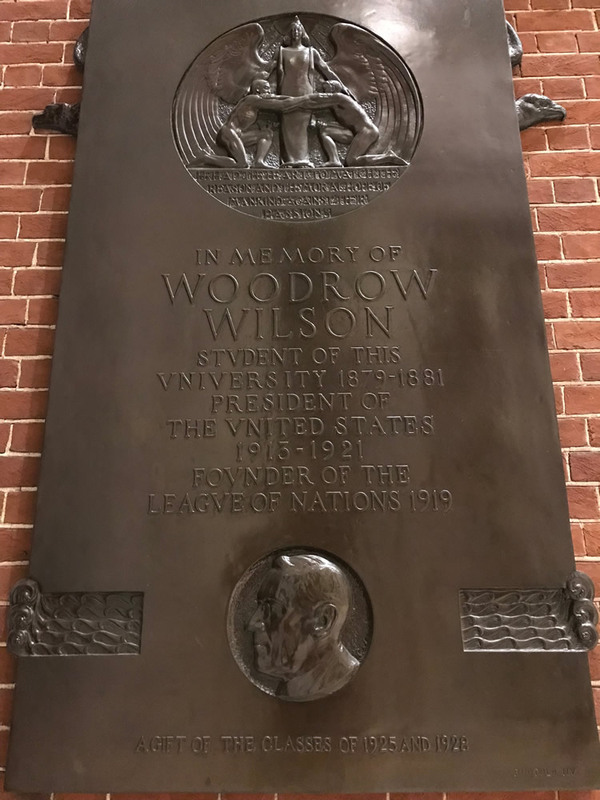 This collection, which includes a plaque honoring Woodrow Wilson, is the whole collection, although UVA plans a memorial to its enslaved laborers. Nor are Charlottesville’s numerous war monuments just one type of public monument in Charlottesville. Nope. There’s virtually nothing else. Charlottesville doesn’t need people scheming up new ways to celebrate the U.S. Civil War or any other war. It needs some public recognition of its history of popular struggle, civil rights work, education, art, music, drama, cuisine, sports, and leadership in a great many nonviolent fields of human endeavor, each far more glorious than “giving” lives to patriotic slaughterhouses.